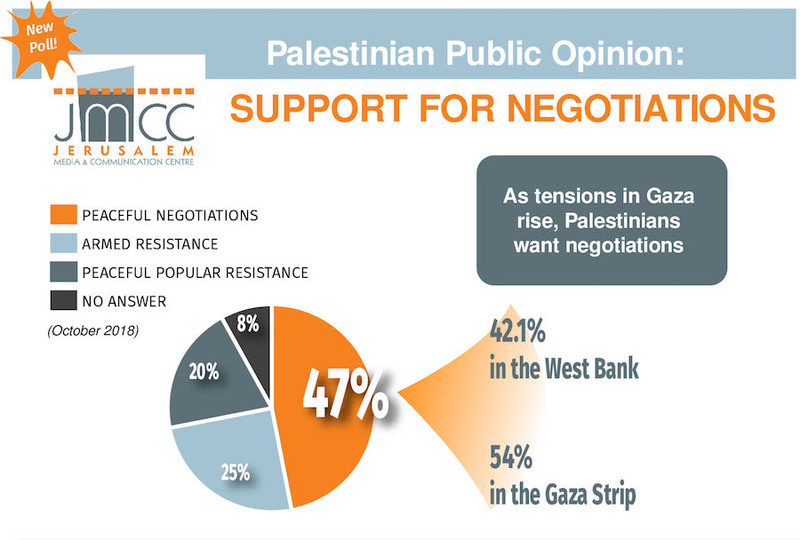 RAMALLAH, October 16, 2018 - Palestinian public support for negotiations with Israel is at an all time high, finds a new Jerusalem Media and Communication Centre poll, despite a moratorium on talks and increasing threats of war. The Gaza Strip, blockaded and in a slow breakdown of basic services, has seen seven months of weekly protests in which 200 Palestinians were killed, with Israeli Prime Minister Netanyahu threatening a different kind of activity. The Palestinian leadership in the West Bank has refused to meet with former peace process sponsor, the United States, and conducts only the most basic negotiations with Israel. Nevertheless, 47% of Palestinians polled, the most in six years, thinks that negotiations is the best way to achieve the Palestinian goal of ending the occupation and establishing a Palestinian state. This number shot up since January this year, when the lowest percentage of respondents (26%) ever said they believed in negotiations. Another 25% argued for armed resistance, continuing a trend since 2013 where armed resistance is the most popular path to independence. Twenty percent of respondents advocated for non-violence popular resistance. The JMCC poll, released today, also offers insight into Palestinian views of domestic violence and gender equality, along with a snapshot of political perspectives. Palestinians overwhelmingly view their government as corrupt (82% say it is greatly or somewhat corrupt), mainly due to nepotism. The poll has a margin of error of +-3 and was conducted with 1200 people from September 19-24.